2 What are the Symptoms of Caliectasis? 3 What are the Causes of Caliectasis? 5 How is Caliectasis Treated? Caliectasis is a type of kidney problem wherein the calyces of the kidneys become enlarged. These calycles are the kidney chambers where the urine passes through and is divided into two groups; major and minor. The minor calycles are the ones that surround the top of each renal pyramid. 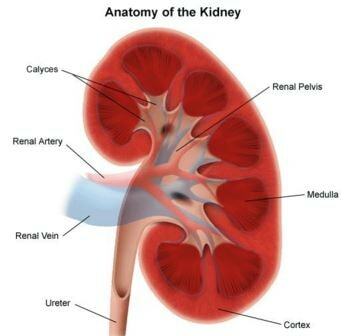 The urine which is formed in the kidneys goes through the renal papilla at the tip and gets to the minor calyx. The dissimilar minor calycles somewhat merge together and made the major calycles. These newly formed calycles are the passage of urine before arriving at the area of the ureter and the renal pelvis. What are the Symptoms of Caliectasis? What are the Causes of Caliectasis? Blockage of the urinary tract – The tract can be obstructed with kidney stones, iatrogenic effects, and malignant growths. Structural malformations – This happens during the development of the fetus, causing the emergence of hydronephrosis; radiation therapy; a condition that had been inherited from the family; surgery; and injury. Patients who are diagnosed with this condition are commonly treated by a urologist, a physician who specializes in the care of the urinary tract. The first thing to be done by the urologist is an ultrasound investigation, wherein an ultrasound image will present the swollen kidneys and the dilation of the calyces. The ultrasound can be of use in knowing whether there is a certain blockage in the area or not. Another useful test is the Intravenous urography, wherein X-rays are being used and a special dye will be injected to assess and see a visualization of the area surrounding the calyces and the kidneys. There are several treatment options for a patient with Caliectasis which should be discussed well with both the patient and the physician along with its strengths and weaknesses. Kidney drainage procedure – This procedure’s purpose is to remove any stones that has caused a blockage in the urinary tract and it is done by draining out the urine to relieve the pressure. Antibiotics – Oral administration is much recommended but any of these antibiotics should be taken based on the physician’s prescription. Surgery – This option is for patients who have kidney stones that are too massive to be passed and for those individuals who present different malignant growths. Generally, hydronephrosis means water in the kidney. It is associated with caliectasis and both of these should be treated right away since the kidneys of the patient might waste away causing their function to be entirely disabled having a great effect on the person’s quality of life. Treating the symptoms of hydronephrosis and caliectasis at the right time is very important in order to stop potential renal failure and emaciation of the kidneys. Toka HR, Toka O, Hariri A, Nguyen HT (July 2010). “Congenital anomalies of kidney and urinary tract”. Semin. Nephrol. 30 (4): 374–86. Chong, TW; Bui, MH; Fuchs, GJ (Nov 2000). “Calyceal diverticula. Ureteroscopic management.”. The Urologic clinics of North America 27 (4): 647–54. Krzeski, T; Witeska, A; Borówka, A; Pypno, W (September 1981). “Diverticula of renal calyces”. International Urology and Nephrology 13 (3): 231–235.